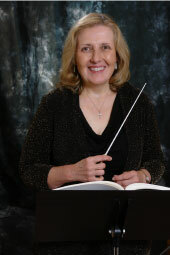 Linda Kirkpatrick - Columbia Bands, Inc.
Dr. Linda Kirkpatrick, author of The Pedagogical Techniques and Methods of Flutist William Montgomery (Edwin Mellen Press), is on the faculty at McDaniel College in Westminster, MD, as the Director of Instrumental Music. In addition to her duties as the flute professor, she is the Director of Bands, the flute choir, and the Music Director/Conductor of the Westminster Symphony Orchestra. She has been a member of the National Flute Association (NFA) Professional Flute Choir, and has led flute choir reading sessions at NFA conventions. She was a co-director of the NFA Youth Flute Day at the Washington, D.C. convention, was the administrator of two annual summer music camps at McDaniel College, and has nine published flute choir arrangements.